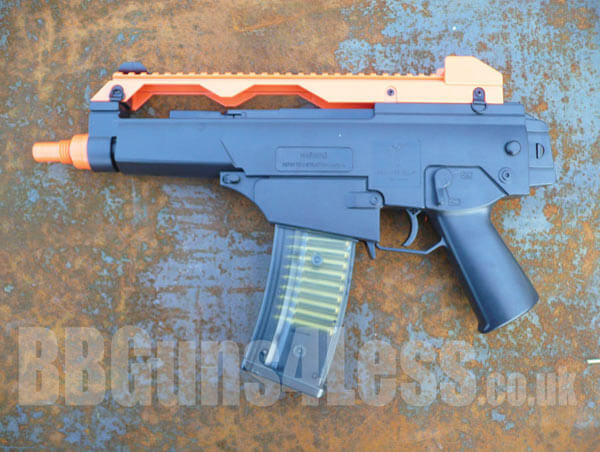 This airsoft gun is a replica of a The Heckler & Koch G36 assault rifle, designd in the 1990’s and used by the Metropolitan Police and the polish GROM special forces. This single shot rifle is a nice quality 1:1 full scale replica bb gun. made by double eagle from toughened abs anti-shock plastic. 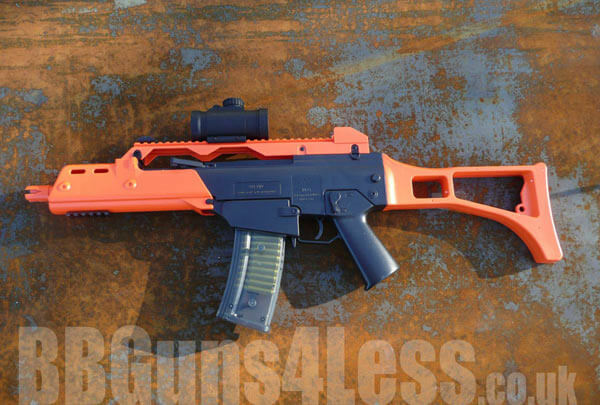 This bb gun is bbguns4less.co.uk’s all time top seller. 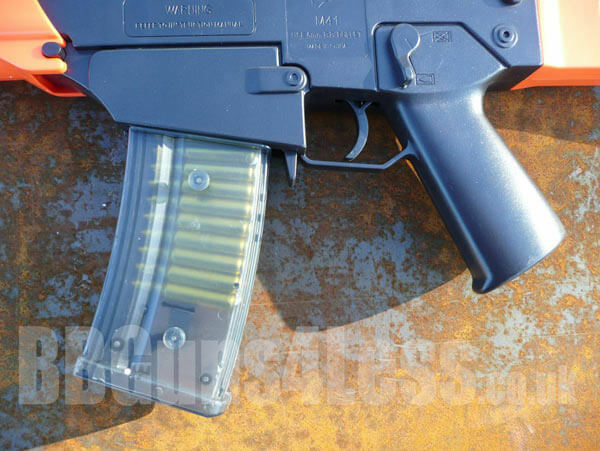 The magazine is a transparent with Visible Bullet shells and looks very cool. 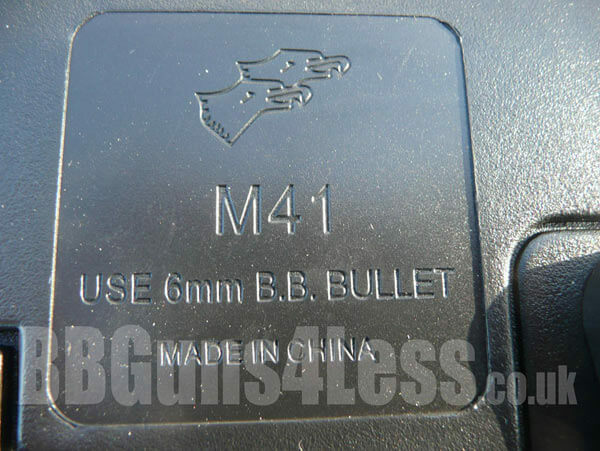 it holds around 20 bb pellets at one time in the mag. Its a 6mm calibre gun that shots at a respectable 280 fps with a range of around 50mt. The bbgun is about 29 inches long and feels good and realistic in your hands. It has a side action spring cocking mechanism so no need for batteries or gas to operate its very easy to use. It also comes with a battery operated tactical flashlight (batteries not included), gun carry sling and around 100 bb pellets. In my opinion it is one of the best guns for that price range, already had loads of fun, great for garden battles. REALLY PLEASED!!!!!!!!!!!! Starting off with the good points, Its really accurate,fairly powerful, sturdy, good size magazine size BUT if the mags capacity isn't enough for you there are little clips on the side so you can clip multiple mags together,It doesn't matter if your left or right handed as the clocker can swing to both sides. Bad points are, that the top mounting rail is flimsy (only flimsy thing on the gun),acog sight isn't all that good and if your not careful when taking the stock off you could snap it easily.So all in all a very good gun for the price. First BB gun I bought and was amazed by it. Very strong built for a plastic gun, solid MAG, very strong cocking handle which took 7 months of continuous use to eventually snap.Took a lot of bashing about and was even shot through the middle with an air pistol and survived. Definitely a first choice for back yard battles with mates. This is the first bb gun i have bought that has decent power and accuracy. The working site is a red cross. Now to the bad point the second day i had it the bolt holding the screw that tightens the site onto the gun popped out, i super glued it and now its fine. The magaizen has fake gold bullets in it. I want 1 my friends say its a beast! 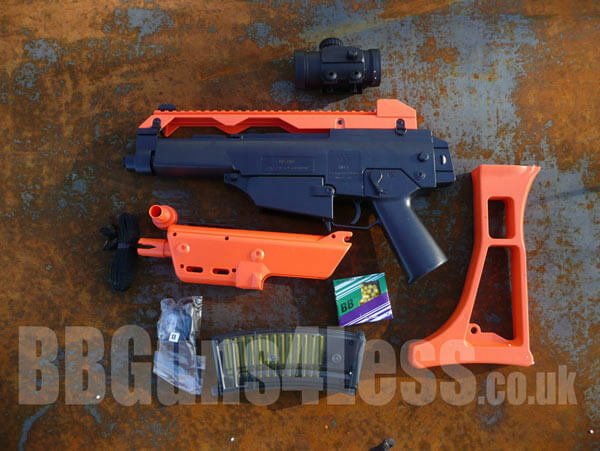 this was my first bb gun and it is a really good starter gun accuracy is good at close range differs a bit when going further away from targets.but as a starter i would recommend and if u want more guns buy them from here.i have got 3 guns from this site by far my favourite is the famas.buy this gun u can change appearance of gun to 3 different styles. I got this gun two years ago it is still working and it is very good it is about 200 fps. However, if you do get a lazer dont use it or the scope. It makes the gun unacrate. Also i have sprayed my gun black it looks mint.